More than one well-intentioned dieter has fallen victim to terrible cravings for pizza. Pizza is one of the most popular foods in the world, and being on a diet likely doesn’t quell your appetite for a slice of Italian pie. Luckily, there is a great pizza choice out there for those who are watching their waistlines and who want to eat healthier. 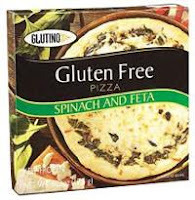 One of my favorite pizzas is the spinach and feta pizza from Glutino. This is basically a small but very filling gluten-free pizza with a twist – no tomato sauce. It is topped with yummy spinach and a blend of feta, mozzarella, and ricotta cheese, and the crust is really nice. Eating foods like this makes dieting seem less like dieting! This is a pizza that you can really feel good about eating. First off, its gluten free, made by Glutino, a company that only makes gluten-free foods. And you’re not only getting a delicious pizza, but it is topped with one of the healthiest foods in the world, spinach. Spinach is nutrient dense and low in calories while being rich in vitamins, minerals and phyto-nutrients. It is a great source of Vitamins A, K, C, B2, B6, and E as well as manganese, iron, potassium, and calcium. And it contains omega-3 fatty acids, niacin, and selenium. And as if that’s not enough to sell you on the benefits of spinach, it is also chock full of flavonoids, which act like antioxidants to protect your body from free-radical damage. Yep, spinach can keep you from getting sick. But it can also keep your gastrointestinal tract in working order, and protect you against eye diseases like macular degeneration and cataracts. Whew! All that goodness on a pizza that tastes great, too, what could be better? On the calorie side, I wish this pizza was perfect calorie wise, but it is a bit high in calories compared to other low calorie pizzas. But, I still like to eat it sometimes, given the nutritional value of the spinach. I just can't follow it with any low calorie ice cream for dessert. The low-down on the pizza is that it is 430 calories, with 16g of fat, 10g of fiber and 4 grams of fiber (so 9 weight watchers points). You can also find this pizza at Trader Joe’s, Whole Foods, Hannaford Supermarkets, Wild Oats, Stop and Shop, and Bashas’, among others, or from the company’s website. If your diet is super calorie restricted and yet you are still desiring some yummy pizza, make sure you check out my postings on pizza pretzels, my favorite pizza sauce and high fiber tortillas great for making pizza, delicious pizza munchees, and spinach pizza lunch pockets. We had to cook gluten-free pizzas at my job this summer for the celiac attendees. We actually used this one a few times and I would always saute up some extra veggies to add on top!